Beacons, with their proximity detection capabilities can help you engage consumers of today by delivering services and information, based on the contextual needs of your consumers. They also allow retailers to measure various metrics along the lines of loyalty, customer engagement etc., and gain insights on how consumers are interacting with ‘offline’ brand environments. Therefore it’s not surprising to see that more than half of the top 100 U.S. retailers are testing beacons this year. However, though beacons have now reached mainstream, most retailers today are still unsure about where to begin or how to integrate beacons with their marketing strategy. In their haste to catch up, a number of retailers are getting caught up with unsuccessful beacon deployment attempts. In this blog, we will discuss in detail about 3 critical components of a successful beacon strategy for retailers. If you are looking to adopt beacons for your consumer facing app, then the first thing that you should consider is the success of your own retail app. (1) Is it widely downloaded? (2) Does it have a good number of engaged users? Without an optimum amount of user base, you won’t be able to accurately sum up how your target customers are taking to this new technology, or if the beacon-messages are resonating with your customers as expected. A strong, engaged user base plays a key role in the success of a consumer-facing app. Collecting crucial app data such as frequency at which mobile-only offers are redeemed for example, is also essential in analyzing the success of your beacon pilot. This will come in handy later on when you need to analyzing your beacon pilot. By comparing with the earlier data you will be able to track if users are redeeming more mobile only offers, or spending more time interacting with the app while in store. This will give a good idea of how well your beacons pilot is performing. On the other hand, if you are looking to adopt beacons for internal purposes then it is important that you equip your staff with devices that work with BLE technology. While beacons definitely are a right step towards gaining a rich understanding of individual customer preferences, your beacon solution including the metrics, analytics and interpretation can’t exist as a silo. Beacons, on their own, will only end up adding more and more data to your system. Once the data provided by beacons is combined with other in-store strategies, it will help you deliver relevant messaging to your customers. Therefore, it is very important to ensure that your beacon solution is well aligned with your current marketing strategy that may include a CRM, loyalty program, e-commerce platform, POS system and a mobile strategy. This way, once integrated, beacons can help you distinguish ‘in-store’ from ‘mobile’ from ‘online’ – three domains that are, today, highly disconnected due to limited integration capabilities. Running a pilot is essential to test the waters and understand what is working for you. It is a good practice to start with a small beacon pilot with a limited set of people( say a maximum of hundred volunteers) and at a few locations. Keeping it a ‘closed’ and ‘limited’ project will help you manage the project better. 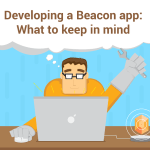 Also, if you are looking to gain insights on how to plan a beacon pilot roadmap or how to plan your pilot budget, you might be interested in checking out our recent webinar on ‘Your Guide to Planning a Successful Beacon Pilot’. It will set you up for success. (1) Decide what kind of content to trigger: What kind of content do you think will resonate with your customers? Do you want to opt for push marketing content such as offers and discounts or pull marketing content such as educational content, videos and reviews? Also, what are the kind of contextual elements that will be attached to the content. You may include, loyalty and time of the day as contextual elements, for starters. (2) Arrive at engagement metrics: How are you planning on monitoring customer engagement? Will it be based on the contextual triggers used to deliver content to customers? Opting in for a beacon platform like Beaconstac will give a clear idea of how your store fares with respect to critical engagement metrics such as dwell time per zone, average visit duration etc. You could also use the platform to gain a solid understanding of the metrics involved in data-driven decision making. (3) Gather customer feedback: The most important aspect of running a pilot is to learn from it. Make sure you ask your customers for feedback on what they liked about their beacon experience and what they didn’t. Taking this into account will help you ensure that you don’t end up irritating your users with beacon-triggered notifications. Once you have thought through how the above mentioned critical components fit into your retail strategy, you will be able to set up a beacon pilot easily and effectively. Did you find these points useful? Is there anything that I missed? Let me know in the comments below.